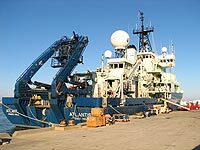 Studying the deep sea requires properly outfitted research ships (R/V for research vessels), with cranes and winches. 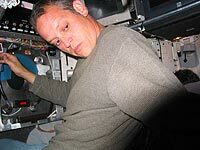 Examples of ones we have used are the Wecoma of Oregon State Univ., the Thomas G. Thompson of Univ. Washington, and the Atlantis of WHOI . 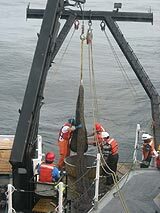 --Research with trawls and dredges is a round-the-clock process. It involves hours of free time as the net goes down then up. During this time we analyze samples and data, sleep, eat, or relax with books, movies, games, watching the sea. 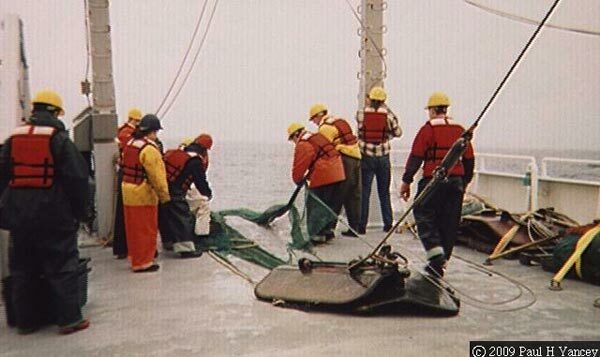 This is followed by intense teamwork when the net returns as the fishes and invertebrates have to be sorted, dissected, analyzed and preserved before they decay. See pictures below. --ALVIN (click for details at Woods Hole Oceanographic Institute) (or click here for an overview of Atlantis and Alvin), which we used in 2006 on an expedition to methane seeps off N. Calif. and Oregon with Dr. Lisa Levin (Scripps), and in 2007 and 2008 to hydrothermal vents on the Juan de Fuca Ridge with Dr. Ray Lee (WSU). 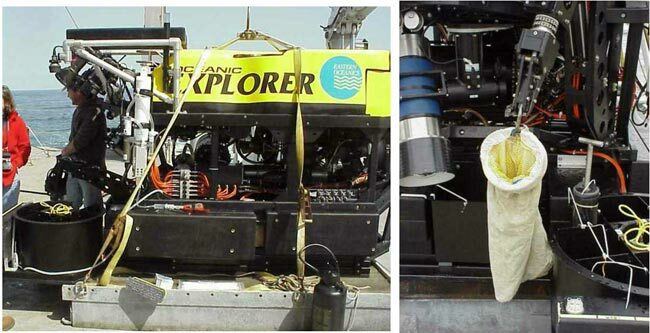 --the Oceanic Explorer (right), which was used on a 2001 expedition with Dr. Lisa Levin to methane seeps off N. California. 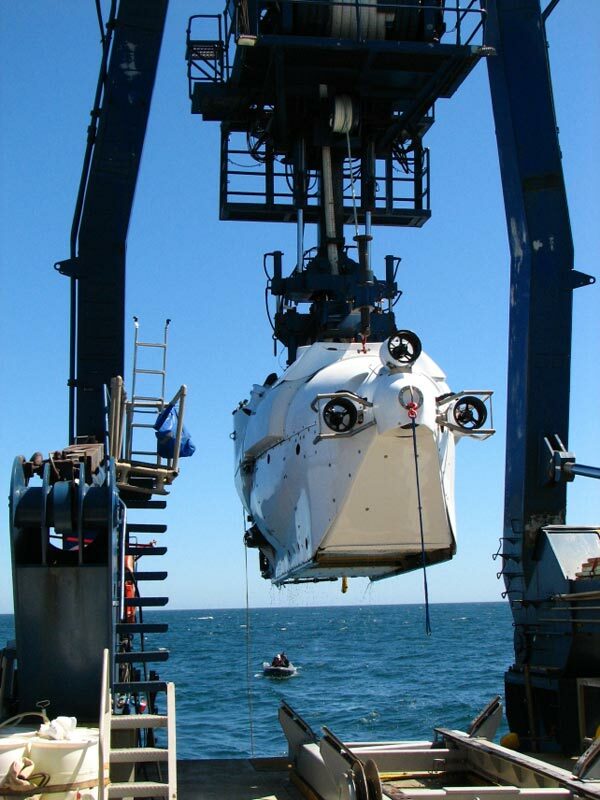 See pictures of Alvin and ROV operations below. 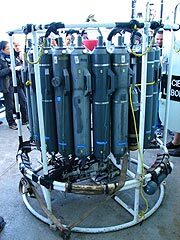 The deepest-diving ROV was the Japanese KAIKO, which was the only vehicle that could dive to the deepest depths. Unfortunately, it was lost at sea in Sept. 2003. 3. 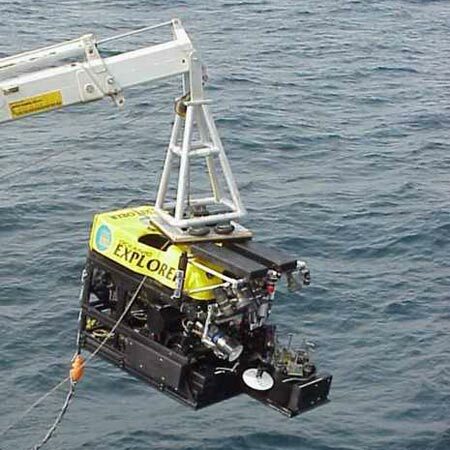 Relatives of the ROVs are the AUVs (autonomous underwater vehicles)--self-propelled robots carrying instruments that can rove the seas for long periods. 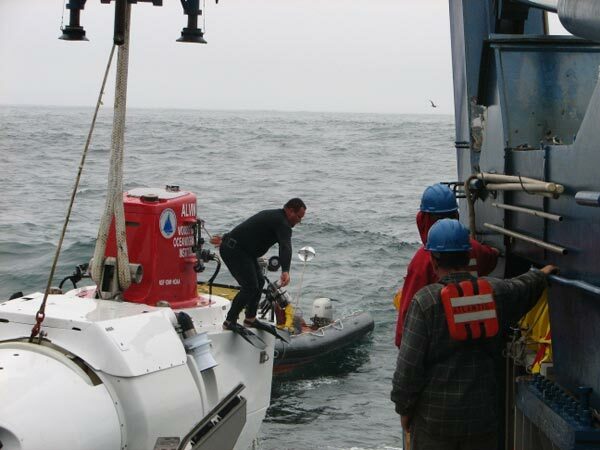 --See LIVE camera images from MBARI's ROVs when they are in operation. 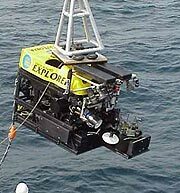 Other deepsea research is using cameras and other instruments on platforms on the seafloor, or on buoys at the surface. 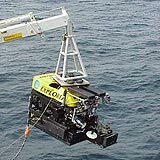 Examples: Hawaii H2O Deepsea Observatory, Mbari's Ocean Observing System (MOOS), the New Millenium Observatory (NeMO) on the Juan de Fuca ridge, and the Neptune Undersea network off western USA and Canada. D. Coring Devices, Water Samplers, etc. 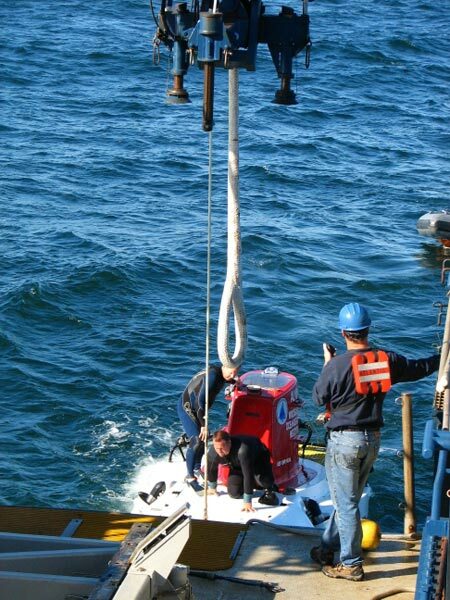 There are also a variety of other devices which can be deployed into the deep with a crane and winch on research ships. 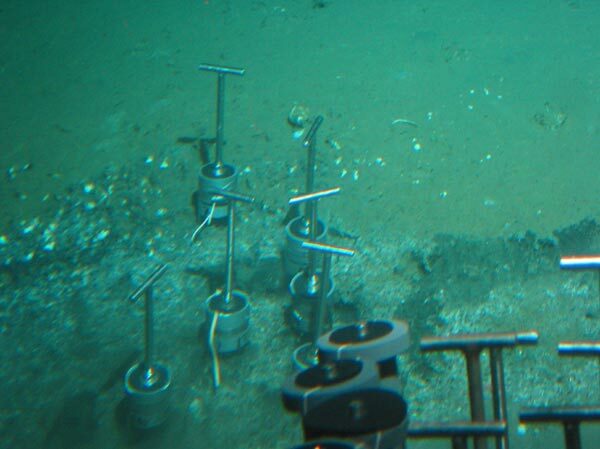 One example is a multicoring device (picture above) which plunges into the seafloor and collects cores of sediment. 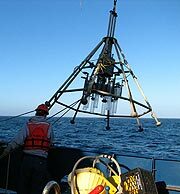 Another is a Conductivity-Temperature-Depth (CTD)sensor and water sampler (see picture, above). 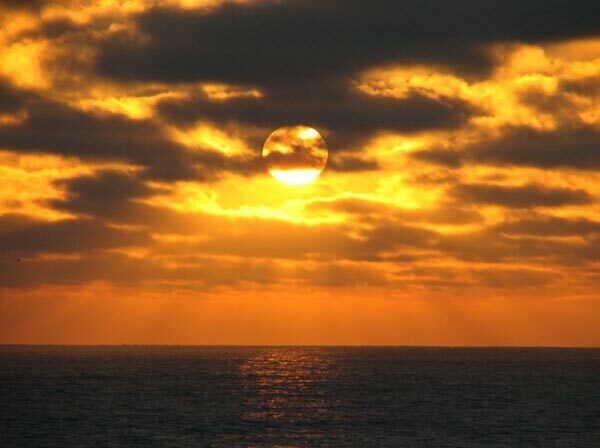 --I thought I saw the famous "green flash" after one sunset. 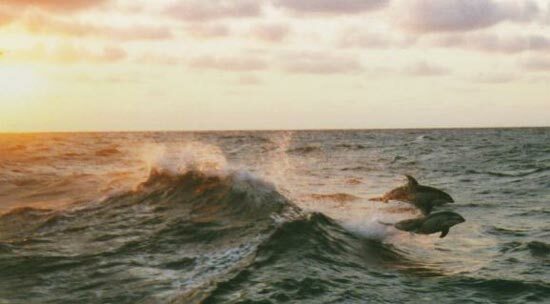 However, astronomer Andrew Young of SDSU reports this flash, though often real, may sometimes be an illusion resulting from red sunset light bleaching out our red retinal cones, leaving our eyes to see yellow light as green (New Scientist, 20-June-98, p.5) 4. Porpoises "surfing"
After securing ALVIN, the swimmers jump off the sub to swim back to the Avon 15. Alvin "baptism"
Although I have been doing deep-sea research for almost 25 years, until 2006 I had not been down in a research submersible because my deep-sea research started on fish, which are much easier to catch by net than by submersible. 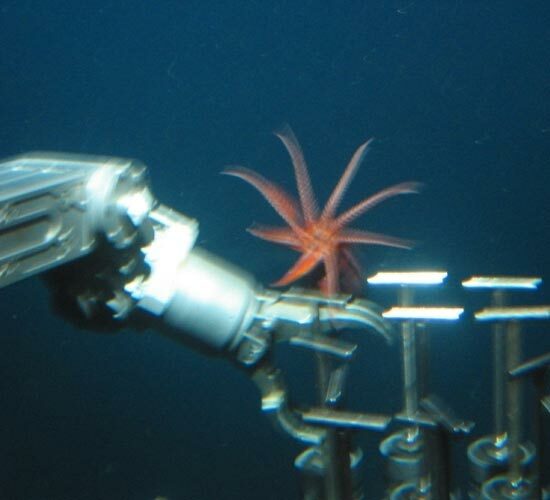 However, my recent work has been on invertebrates, and submersibles and ROVs are great for collecting many of those. 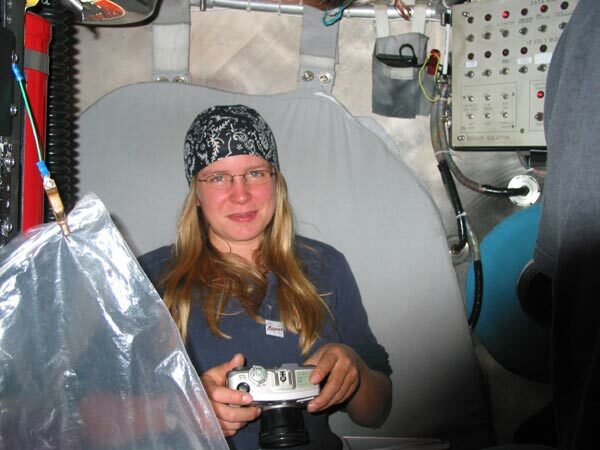 Thanks to Chief Scientist Lisa Levin (Scripps), in July 2006 I spent 8 hours in the Alvin, diving to 906m (about 3000ft) at Hydrate Ridge's East Basin off Oregon. [See my Seeps and Vents Page for more information and pictures.] Tina Treude (USC) and I dove with pilot Gavin Eppard. On the morning of our dive, it was touch-and-go on the weather, as the winds were near 25 knots, the unsafe limit. Finally we got the go-ahead. After we were sealed in and released into the water, we bounced around in the high waves for a bit, then Gavin flooded the ballast tanks and we began to sink slowly. It took about 45 min to reach 880 m. During that time, in which the sub lights are off, pure magic appeared out our windows as the sunlight faded into night. The ocean became a galaxy of flashing lights, far more than you ever see in videos! I could see luminescent jellies, squid, 4ft-long siphonophores, shrimp, and even fish blinking their headlights as they darted by. 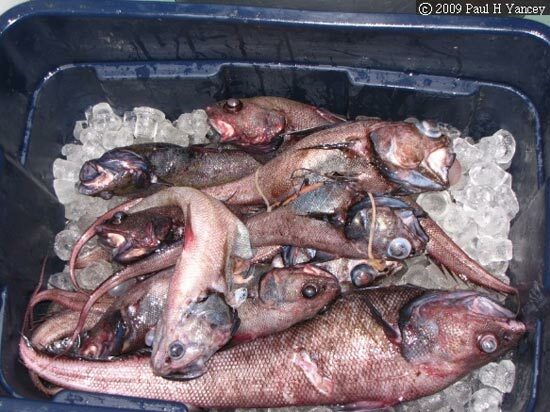 [See my Midwater Page for examples of these animals]. 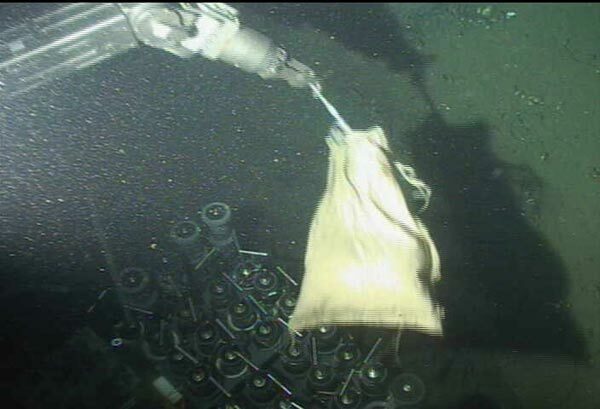 Finally we hit bottom and began our real work of collecting tubecores of gas-oxidizing bacteria and methane hydrate, rocks, and animals. 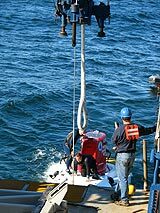 Gavin was incredibly adept with the sub manipulators, moving the tubecores in and out of the sub holders and seafloor sediment with ease. We saw mounds of frozen hydrate; grey, white and orange bacterial mats; clambeds; carbonate rocks; sponges; searobins, eelpouts and hagfish; large Neptunea snails tracking across the mud; and mushroom corals. As we worked, larvaceans, ctenophores, jellies and fish drifted or swam past us. We also saw mysterious rings that might be methane hydrate (frozen natural gas) in a form that we've never heard described before. About half-way through, the real prize appeared--a mysterious transparent squid with tentacles sprouting up from its head rather than in front as in 'normal' squid. I tentatively identified it as a Teuthowenia-type squid. The creature stayed by us for several minutes, allowing us a great look. As it got close to us, its head and tentacles turned red, then it darted off across my window. At one hydrate site, Gavin used the sub manipulator to grab a rock. Upon our return, we found it to be a beautiful vent rock, lined with crystalline chimneys through which gas once bubbled. Later, he also grabbed a rock composed mostly of shells. Upon finishing our collecting at the designated target areas, we had an hour of battery power left, so Gavin took us exploring down slope to see if there were undiscovered hydrate sites. He let each of us take a 5-min turn at the helm (actually, a joystick with 3 dimensions of control). While I was driving, we did come across a large bacterial mat around carbonate rocks. We eventually reached 906m before turning back. Finally it was time to blow the ballast, drop the lead weights, and head up. Gavin loaded Led Zepplin into the sub stereo, turned off the lights, and again we rose through a luminescent fairyland. Finally we bounced to the surface and found ourselves in high waves, seesawing madly. It took some time to bring us safely aboard, and we found later that the winds were above the safe level. 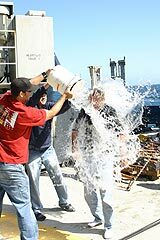 Once secured on board, we climbed out, and I was treated to the traditional bucket of icewater on my head and a hosedown with seawater! All told, the dive was one of the highlights of my life. 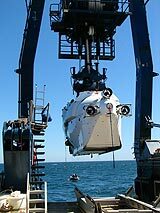 I still marvel at the skills of the pilot, swimmers, and all the other Alvin teammembers...and the entire crew of the Atlantis. Working with the other scientists was also a pleasure. My thanks to everyone! 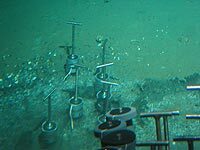 Addendum 2008: Thanks to collaborator Ray Lee of Washington State University, I dove again in Alvin in July 2008, this time to 2200m at the Faulty Towers hydrothermal vent field on the Juan de Fuca Ridge. This dive was truly otherworldly. Vent chimneys (known as white smokers) up to 70 ft (22m) rose above the seafloor spewing warm mineral-laden water. At the base of these towers, we came within sampling range of black smokers with water up to 600F (over 300oC).